New market to offer food, wellness programs in north Mpls. 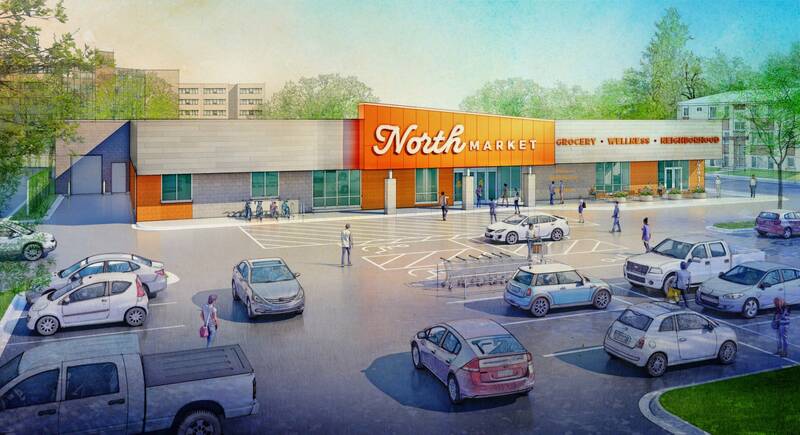 A new full-service grocery store is coming to north Minneapolis. The North Market is scheduled to open in a couple of weeks at 4414 Humboldt Ave. N. It'll be owned and operated by the nonprofit Pillsbury United Communities. Adair Mosley, interim president and CEO of Pillsbury United Communities, said the store will also have a wellness center run by North Memorial Health. "It's really going to be a dietician, using community health workers, helping people who have chronic diseases such as diabetes and cardiovascular disease," he said. "How do they live their best life? A lot of that starts at the point of place where they buy their food." He said the project is also putting north siders to work, creating two dozen or more jobs that will be filled largely by people from the neighborhood. "We've been hiring from the community," he said. Mosley said that although the area has convenience stores, the closest full-scale supermarkets are 3 miles away. Much of the city's north side is known as a "food desert," which is a federally designated area of low-income residents with little access to grocery stores. To get off the ground, the North Market project received several private contributions and $2 million in state money. The North Market is scheduled to open Dec. 13. It comes just four months after the smaller Wirth Cooperative Grocery opened in north Minneapolis.